Nemo Tent - KUNAI 2P 4 Season Mountaineering Tent : The most versatile tent on the market for alpine backpacking year round. The first all-mountain tent in the category, Kunai™ stands apart for being able to offer security and comfort from the glacier to the summit. Capacity: 2 Person. Minimum Weight: 1.8 kg. Packed Weight: 2.1 kg. Floor Dimensions: 216 x 130 cm (footwidth 107cm). Floor Area: 2.5 sq m. Vestibule Area: 0.7 sq m. Interior Height: 107 cm. Packed Size: 19 x 15 cm dia. Number of Doors: 1. Colour: Sunburst Orange. Limited New Stock Due Mid December 2017. Nemo Tent - MOKI 3P 4 Season Mountaineering Tent : A bomber expedition tent designed for extreme cold weather. Convertible panels reveal mesh for milder base camp conditions. Optional Moki™ Link available for joining tents together. Capacity: 3 Person. Minimum Weight: 3.8 kg. Packed Weight: 5.4 kg. Floor Dimensions: 229 x 191 cm. Floor Area: 4.0 sq m. Vestibule Area: 1.1 sq m. Interior Height: 122 cm. Packed Size: 46 x 20 cm dia. Number of Doors: 2. Colour: Skyburst Orange. 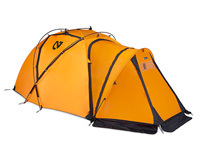 Nemo Tent - MOKI 3P Link : Zips between two Moki tents to make a weatherproof connection and provide a common area for meals and trip planning. 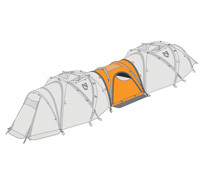 The Link is floorless, allowing you to dig out a footwell in the snowpack, and includes doors and overhead ventilation..
Nemo Tent - MOKI 3P OPTIONAL SECOND VESTIBULE : With this additional vestibule, you can utilize one vestibule for linking to a second Moki and keep the second vestibule for a sheltered entryway. The Tenshi™ 2-person Mountaineering Tent provides security and comfort from the glacier to the summit. Nemo Tent - Tenshi 2P: Use Tenshi™ at base camp with all the comfortable features and cache them as you move up the mountain. Start with a cavernous vestibule and a Condensation Curtain™ and reach high camp with a 4.4 lb shelter that fits on the smallest of ledges. Beefed-up guy points, reinforced pole pockets, and DAC Featherlite® poles make Tenshi™ all but indestructible. 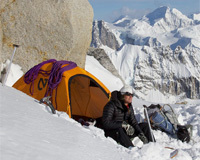 The recipient of several awards, including “Editors’ Choice” from Climbing, “Best In Gear” from Rock and Ice, and “Editors’ Choice” from Backcountry, Tenshi™ is the clear choice for high altitude adventure. Includes GREEN™ anodized DAC Featherlite® poles, full vestibule, Condensation Curtain™, roll-up style stuff sack, stakes, and repair kit. 2 person, mountain tent Condensation Curtain isolates respiration in a small portion of the tent preventing frost build up Features the Sleep Tight Anchor System (STAT) a waterproof and convenient way to stay tied in all night Rear window improves breathability and doubles as an escape hatch Removable insulated floor DAC Featherlite poles, reinforced guy points and pole pockets and multiple internally deployable overhead vents. Weight: 3.0 kg Packed size: 48 x 20 cm. Floor dimensions: 218 x 119 cm. Floor area: 2.6 m2. Vestibule area: 1.0 m2. Interior height: 107 cm. 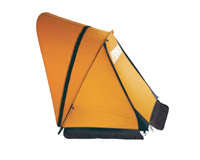 The Nemo Alti Storm™ series tents are bombproof bunkers for long stays deep in the winter backcountry. Built rugged for heavy snow loads and high winds. Nemo Tent - Alti Storm 2P: The ridge poles continue to the ground, buttressing the tent against high winds, while the inner tent canopy is breathable ripstop for blocking out driven wind, sand, and snow. The fly is full coverage with expansive vestibules and deployable vents. Every exterior anchor, guyout, and zipper pull is reflective for easy spotting with your headlamp. Light Pockets™ built into the tent provide an easy way to illuminate the interior. Alti Storm™ models come with GREEN™ anodized DAC Featherlite® NSL poles, roll-up style stuff sacks, stakes, and repair kit. Capacity: 2 Person. Minimum Weight: 4.0 kg. Packed Weight: 4.3 kg. Floor Dimensions: 262 x 137 cm. Floor Area: 3.2 sq m. Vestibule Area: 2.6 sq m. Interior Height: 112 cm. Packed Size: 51 x 18 cm dia. Number of Doors: 2. Colour: Orange. Out of Stock. No longer produced. Nemo Tent - Alti Storm 3P: The ridge poles continue to the ground, buttressing the tent against high winds, while the inner tent canopy is breathable ripstop for blocking out driven wind, sand, and snow. The fly is full coverage with expansive vestibules and overhead deployable vents. Every exterior anchor, guyout, and zipper pull is reflective for easy spotting with your headlamp. Light Pockets™ built in to the tent provide an easy way to illuminate the interior. Alti Storm™ models come with GREEN™ anodized DAC Featherlite® NSL poles, roll-up style stuff sacks, stakes, and repair kit. Capacity: 3 Person. Minimum Weight: 4.9 kg. Packed Weight: 5.4 kg. Floor Dimensions: 287 x 190 cm. Floor Area: 4.9 sq m. Vestibule Area: 3.0 sq m. Interior Height: 117 cm. Packed Size: 56 x 19 cm dia. Number of Doors: 2. Colour: Orange. SHIPPING : All purchases are sent via Courier - Signiture Required. Courier costs are additional.